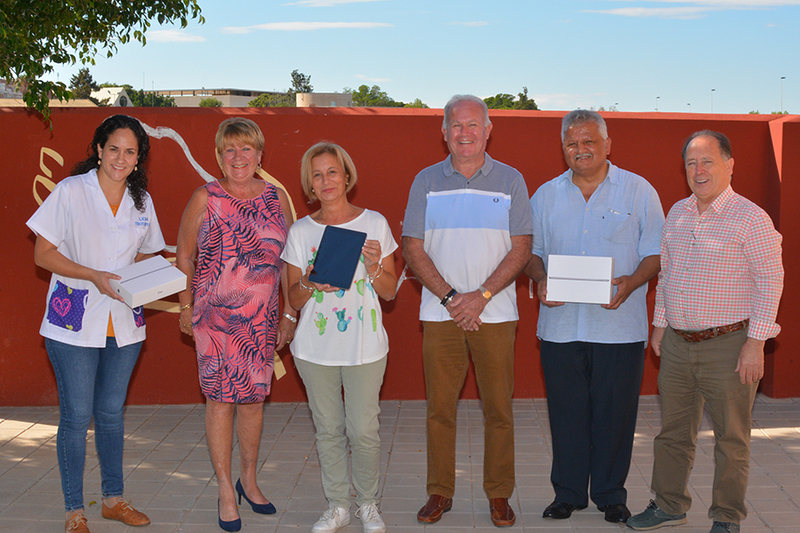 A presentation was made, at the premises of AFA Torrevieja, (Associación Alzheimer de Familiares y Amigos de Torrevieja) on 17th October by the Worshipful Master of the Lodge, WBro John Evans, and his wife Denise accompanied by W.Bros Lyn Organ and Ray Collins. John said that he and his wife Denise chose A.F.A. as his charity for my year as Master of Old Tower Lodge as it is a organisation close to our hearts, having watched my mother suffer with this illness many years ago. During my year we raised money for this well deserving charity by arranging various money raising functions including Denise’s Ladies Night which was extremely well supported. As a result I have been able to donate just under 2.200 euro’s to the A.F.A in Torrevieja. This has enabled them to purchase 15 high back chairs for their patients comfort and 2 new I Pads to improve their technical capabilities. Maria Purificacion Garcia Alvarez. President of AFA Torrevieja. Mario Cespedes. Committee member of AFA Torrevieja.